JOSE “CHEPO” REYNOSO, Manager and Trainer of Canelo Alvarez spoke to the boxing media after the Canelo Alvarez Rocky Fielding press conference. Q – What does it mean to you and Canelo to be able to fight here in MSG? Chepo – Well its an honor to come to a boxing sanctuary like Madison Square Garden, like I explained in the story I told earlier ( Ramos v. Fraizer jun 24,1968) its been over 50 years ago and to come from a place like that is something very incredible, something unforgettable. We hope come December 15 all that gets crowned by Saul with the title victory. Q – With fighting here in MSG for the first time, Canelo has accomplished alot in his career. What else would you like to see Canelo accomplish in the sport of boxing? Chepo – Well, to continue beating everyone who’s put in front of him (Canelo) and to continue writing and writing, because each fight is a page in his story and right now this fight is his most important page after having to write down the pages of Golovkin and having to write down the pages of Chavez, all in which are going down in his book of boxing. This page that’s next is a very important page because he would become one of the few Mexican boxers to win a title in 3 different divisions. So all that is very important. Q – A Lot of people believe that after the fight with Floyd Mayweather, Canelo has grown and learned alot. If the opportunity presented itself, would you want a rematch with Floyd and if agreed on what would you guys do differently in this fight with Floyd? Chepo – Well he’s (Canelo) now a fighter with a lot of experience, we’re talking 5 years later. Canelo has learned and continue to learn alot. We are confident that if this fight was to be made that Canelo would accomplish the victory. At that time Canelo was only 23 years old. We thought he was ready to win but we were dominated by Mayweather’s experience. But I believe that if the fight was to come to happen the fight would be different, completely different. Q – Canelo has grown and gotten alot better, as Canelo’s trainer what would you like to see Canelo do more in his fights or what do you belive canelo is still missing to get to that level where he’d become an even better fighter? Chepo – Well that history will show. He just finished beating the best pound 4 pound fighter which was Golovkin, which now should make him the best pound for pound fighter because he just beat the best pound 4 pound. So of course if you beat him then its your turn to be the best pound 4 pound. What he’s missing is he’s missing what the fights continue to give him. To me he’s a complete and well made fighter, so its just the experience. each fight gives you experience. The experience you never stop from wanting it. He’s a complete fighter who has accomplished a lot of important things. So what’s next is to continue gaining more and more experience and surely you’ll witness a great champion. Q – What would you like to tell the Hispanic community that live nearby Madison Square Garden for them to come December 15 to support Canelo? 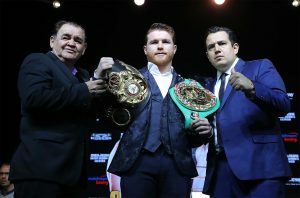 Chepo – Hope they all can come to support Canelo. To come feel proud of a Mexican for what a Mexican is doing in a distant land like New York on a historic stage like Madison Square Garden. So that they can feel it when they say, “look at what a Mexican born from a small village near Guadalajara is doing and accomplishing”. Chepo’s Speech at the Canelo vs Fielding press conference.